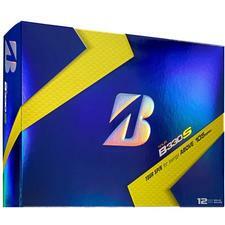 Bridgestone Golf Tour B330 S Golf Balls - 1 Dozen - White - $34.99 - GolfersEdgeOnline.com - Best Golf Equipment On The Web! The NEW TOUR B330-S features a firmer TOURcore designed to increase ball speed for longer distance. The NEW patented SlipRes cover produces maximum greenside performance, higher friction for more spin from the rough and less spin off the driver for increased distance. A new engine – The all new Tour Core is 6% larger and utilizes a steeper gradient in softness from the inner part of the core to the outer region, resulting in faster ball speed and more reduced spin off the driver than ever before. Our proprietary gradient technology in the core allows us to accomplish in one layer what others accomplish in two or three, leading to a smoother energy transfer and more power generated by the B330. An R&D marvel – The newly formulated SlipRes Cover is the highest performing cover Bridgestone has ever produced on a golf ball. It has the highest friction coefficient rating possible, to achieve the impossible: maximum greenside spin without losing any spin from the rough AND reduced spin off the driver for longer distance. SlipRes also delivers a self-repairing cover for longer playability. More Distance – More Spin – More Playability, guaranteed! Consistent flight in all elements – Seamless Cover Technology (SCT) is a proprietary manufacturing process that eliminates the straight part line and creates a non-uniform part line around the golf ball. The result is the most consistent golf ball in terms of accuracy, distance and trajectory ever created. The best wind performance – Our proprietary dual dimple cover pattern feature smaller inner dimples that further reduce drag at launch for faster elevation, while the larger outer dimples promote a shallow angle of descent for increased rollout on landing. The result of the improved performance at both takeoff and landing is greater overall distance performance and more consistency in the wind. If you have any more questions about the Bridgestone Golf Tour B330 S Golf Balls - 1 Dozen - White; do not see the model you are looking for; need custom options; or prefer to not purchase online, then please call us at (630) 656-1291.